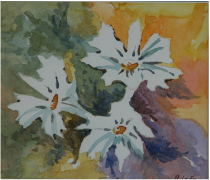 This workshop will help you to loosen your painting style and add a sense of spontaneity to your painting. You will learn the art of using Chinese brushes to create very broad and very fine marks. All equipment will be supplied within the cost of the class for your convenience. There will be demonstrations on: how to create washes and work wet into wet; how to blend graduated washes; upside down washes; merging tones; variegated washes; and how to achieve muddy colours with a result of colours bleeding into each other. Experimental washes such as dropped-in colour, meeting an edge, masking out, improving coverage, pencil washes, soaking up drips, how to control excess water and wet into wet effect will be some of the techniques learnt in this workshop. These will be demonstrated and documented for you to take home notes at the end of each session. ​Helpful tricks and discovering what a medium can do will be covered, including how to apply a soft glaze, pencil tricks, spattering, sponging, under the tap and washing off pigment, scratching back into your watercolour to add highlights, and erasing vigorously to break up textures. ​Morning tea is included, along with tea and coffee, though lunch should be provided by the participants.